Review: It seemed so wonderfully, beautifully, romantically different from anything she had known. And yet, she felt, somehow not different at all. Sophie is a girl from rainy London and she dreams of a magical place such as this one. The author Cathryn Constable has written The Wolf Princess in such a frosty, cheek-blushing way that you just can't get enough of the wild and beautiful forest. This book is filled with all of the magical action, adventure, and truth that you can handle. Sophie Smith and her two best friends, Delphine and Marianne, live in London. Sophie's father has died, and the girls soon end up somewhere in Russia that strangely reminds Sophie of her beloved father, and her frosty dreams. They discover a new friend, Anna Volkonskaya, who takes them on a journey that they will all never forget. 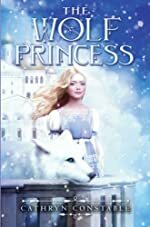 But when a princess turns out to be nothing they had ever expected, and when a wolf unexpectedly shows up, Sophie has to become another person to save a wonderful palace, friends, wolves, and a princess. The Wolf Princess is the most creative, wildest, and frostiest story I have ever read! The setting made the story very interesting. The blowing snow and the wild forest created a great image in my mind. I cannot relate to any of the characters in this book, for they are all so unique. Cathryn's writing style made this story keep going like when Sophie said, ÒYes, I saw it.Ó What did she see? Read and find out! This book would be great for grades 5 - 9. The Wolf Princess started out very slow and calm, but quickly became magical, exciting, and wild! This story is also told in first person and that made the story very easy to understand and that made the setting very detailed. This story showed me to go with your gut and at times, when you need to, don't follow the rules. We would like to thank Scholastic for providing a copy of The Wolf Princess for this review. Have you read The Wolf Princess? How would you rate it?